The Earth, as seen from Apollo 17. Climate in a narrow sense is usually defined as the “average weather”, or more rigorously, as the statistical description in terms of the mean and variability of relevant quantities over a period of time ranging from months to thousands or millions of years. 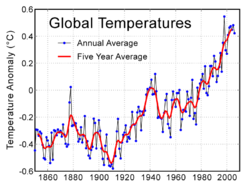 The classical period is 30 years, as defined by the World Meteorological Organization (WMO). These quantities are most often surface variables such as temperature, precipitation, and wind. Climate in a wider sense is the state, including a statistical description, of the climate system. In the original Greek sense, ' Clime,' was a concept used to divide the world into climatic zones sharing similar climatic attributes such as temperature, length of the solar day (sunlight), and in particular latitudinal distance from the equator. Modern data and analysis show that the latitudinal concepts of antiquity are too simplistic. Instead, the latitudinal trend is altered by such features as hills or mountain ranges, large lakes, and seas or oceans. Consequently, today's climate regions are classified on the basis of temperature and precipitation alone. Examples of such climate schemes are the Köppen climate classification and the Thornthwaite climate classification. In broad terms, climate zones range in latitude from tropical (hot, no real seasons based on temperature) to mid-latitude (moderate; conventional winter-spring-summer-autumn seasons) to polar (cold; strong seasonality; long winters). They also divide into Continental (high contrast between summer and winter) and Maritime (ocean influence moderates temperature extremes, but generally contribute extra moisture to local weather patterns). The mid-latitude 'conventional four seasons' only work well in the mid-latitudes. In other regions, the more useful divide is into "wet" and "dry" seasons based on the monsoon. For the climate of a specific place or area, see the article on that place or area. Over historic time spans there are a number of static variables that determine climate, including: latitude, altitude, proportion of land to water, and proximity to oceans and mountains. Other climate determinants are more dynamic: The thermohaline circulation of the ocean distributes heat energy between the equatorial and polar regions; other ocean currents do the same between land and water on a more regional scale. Degree of vegetation coverage affects solar heat absorption, water retention, and rainfall on a regional level. Alterations in the quantity of atmospheric greenhouse gases determines the amount of solar energy retained by the planet, leading to global warming or global cooling. The variables which determine climate are numerous and the interactions complex, but there is general agreement that the broad outlines are understood, at least in so far as the determinants of historical climate change are concerned. Scientists use climate indices in their attempt to characterize and understand the various climate mechanisms that culminate in our daily weather. Much in the way the Dow Jones Industrial Average, which is based on the stock prices of 30 companies, is used to represent the fluctuations in the stock market as a whole, climate indices are used to represent the essential elements of climate. Climate indices are generally identified or devised with the twin objectives of simplicity and completeness, and each typically represents the status and timing of the climate factor it represents. By their very nature, indices are simple, and combine many details into a generalized, overall description of the atmosphere or ocean which can be used to characterize the factors which impact the global climate system. Because the climate indices are generally determined from measurements made in a localized area, they can have impacts in other areas around the globe, through processes sometimes called teleconnections. Why and how do scientists study climate change in the Arctic? What are the Arctic climate indices?